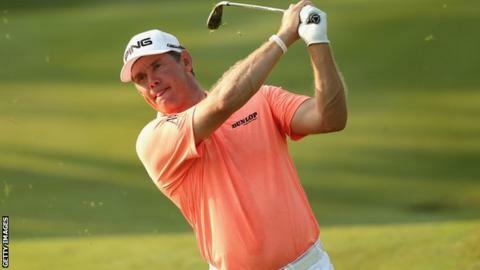 England's Lee Westwood shot a seven-under 65 to lead by one shot in a weather-delayed opening round of the Malaysian Open in Kuala Lumpur. Belgium's Nicolas Colsaerts is second, with Northern Ireland's Michael Hoey a shot further back. Westwood bogeyed the par-five 10th, his first hole, but finished with four birdies in his last five holes. The 40-year-old, seventh at last week's Masters, said: "It's nice to have a good one and build some momentum." The former world number one, now ranked 36th, is without a win since victory at the Nordea Masters in Sweden in 2012. He added: "I had to be patient because I was hitting good putts and they weren't going in until I holed one from about eight feet on my 16th. "I played well last week and I was happy to carry that on today." Portugal's Ricardo Santos joined Hoey at five under, with Scott Jamieson among those a shot further back after completing 16 holes before darkness caused play to be suspended for the day. Defending champion Louis Oosthuizen managed a level-par 72.